Where are you located? What is the closest airport? What is the cost to send my son or daughter to KW Legacy Ranch? Will my insurance cover the tuition? How do I get my child to the ranch? How do I communicate with my child while they are in the program? What if my child is currently taking medication? What types of students are enrolled at KW Legacy Ranch? Does KW Legacy Ranch have any religious affiliation? KW Legacy Ranch is located in the beautiful Pahranagat Valley in Southern Nevada. This ideal location presents your family with the advantage of receiving uninterrupted treatment in a peaceful setting away from life’s distractions while still being conveniently located near a major international airport. The Las Vegas airport is the closest major airport and is located just 2 hours from KW Legacy Ranch. KW Legacy Ranch offers a flexible length of stay that will vary depending on your family and child’s particular needs. The minimum length of stay is 6 months with the ability to receive longer treatment as needed and on a completely individualized basis. This flexibility allows you to see how your child will respond to treatment first without having to be locked in to a long-term contract. Once your child is in the program, you and the treatment team can determine the appropriate length of stay based on your teen’s progress throughout the program. We typically maintain a 1:4 staff to student ratio throughout the day. However, with a maximum of only 15 students in the entire program, this ratio is often even lower. This means that your son or daughter is receiving an extraordinary amount of individual attention and personal help during their time on the ranch. This also allows your child to be continually and appropriately supervised at all times, so you don’t have to worry about that either. Well, we’re a real ranch. So if you’re expecting your son or daughter to be pampered at a 5 star resort, then you’ve got the wrong place. If you’re expecting your son or daughter to be safe in a comfortable setting while undergoing a life-changing experience that will be difficult at times, then you’re on the right track. Our facility is a beautiful 4,000 square foot home located right on the ranch. Students sleep 2 or 3 per room. The ranch consists of fields, corrals, animals and just about everything else you would expect on a working ranch that will help in your child’s transformation. Additionally, we utilize both private land in the mountains where we camp and work on projects as well as range land where we keep the cattle at certain times of the year. These other unique environments give your child many opportunities to experience ranching, riding the range, camping, and other activities to assist in your son or daughter’s powerful change process. Because every situation is different, length of stay and tuition will vary. We offer multiple options depending on your family’s specific situation. Please contact us for a Free Family Audit at 775-725-3900 to help determine your needs and goals. The easy answer is no…at least probably not. KW Legacy Ranch doesn’t fall into any category that is typically covered or reimbursable by insurance. We are not a “medical” facility nor do our students meet the standard insurance definition of being an immediate threat to self or others (although we would disagree with the part about not being a threat to self if they continue on their current path, but that’s another story). So the easy and unfortunate answer is that although your child will receive excellent treatment by trained professionals and counselors in a highly structured and therapeutic setting ideal for teens, your insurance company probably won’t be much help covering the tuition. Yes! We work with excellent healthcare lenders to offer financing options for our families. These financing options allow you to get the needed help for your child right now without having to come up with all of the tuition at once. Please contact us at 775-725-3900 for help with financing. There are multiple ways to get your child to KW Legacy Ranch. Of course, if at all possible parents can bring their son or daughter themselves. You are welcome to personally tour the ranch, meet the staff, and enroll your child at any time. Some families will send their child with another adult family member or family friend. If you are concerned your child may react in a negative way or if you have any fears of them running away either before or during the trip, then we recommend using a safe transport service. These are licensed and professionally trained individuals who will assist you in making sure your child arrives safely. They will pick your son or daughter up at home and accompany them the entire way to the ranch. Their number one priority is your child’s safety. If you would like to learn more about the safe transport option, please contact one of our family consultants at 775-725-3900. It is important that your son or daughter continue their academics at this point in their life. If your child is struggling in other areas of their life, but doing well in school, then it may be detrimental to their progress to enroll them in a program where they can’t continue their academic education. This is just one more stressor they would have to worry about upon returning home. 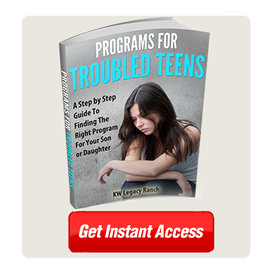 If your child is struggling in school, then this could be part of the reason they are coming to the ranch, and we can help them figure out what is troubling them. Also, academic struggles can add to their issues of self-confidence and behavior. What we are trying to say is that academics and school are an important piece of your child’s success right now. At KW Legacy Ranch, we will absolutely continue their schooling. Keep in mind that behaviors, life choices, and well-being will take precedence over school. However, schooling can be one of the ingredients in their recipe for success. Our goal is to make learning a privilege and to see their excitement for learning return again. We partner with a renowned independent high school so that your child will be able to continue their academics. The school has nationally recognized accreditation through the Northwest Accreditation Commission and is fully recognized by high schools and colleges across the country. The credits earned while in the program can be transferred with your child upon graduation from KW Legacy Ranch. Your son or daughter will receive a customized graduation plan individualized to their current academic standing which will form the nucleus for their academic goals throughout their stay. Upon completion of the program, students can either graduate with a diploma from the high school (if they have obtained the necessary credits); they can continue with this same independent high school from home; or they can transfer to their previous school or any other school that may be more appropriate and transfer the credits they earned while at the ranch. Family communication is extremely important throughout this process. We want to help your family either continue their successful communication or reestablish that line that was broken. It is also important to do this in a way that will not impede treatment. Communication will take place through letter writing, phone calls with your child’s therapist, phone calls with your child once they have reached a certain phase in the program, updates from the program, in-person visits to the ranch to spend quality time with your son or daughter, and home visits. All of this is designed to help every member of your family grow and heal together. Although we are not a “lock down” program, we are definitely equipped to work with students who may attempt to run away. While runs are very rare, we have thorough safety measures in place to deal with any attempt. Your child will always be with awake staff 24-hours a day. These trained professionals are checking to ensure your child is safe even throughout the night and are there to help deter any run attempts. Other measures include a comprehensive evaluation and observation period during the initial phase of the program when a run attempt may be more likely. Additionally, the serene but isolated location of the ranch helps present a natural deterrent for students thinking about running. We provide you with an exact list of everything your child will need prior to enrollment. If it’s not on the list, then we take care of it for you. Some things to note: Students need to bring a supply of prescription medications (if applicable), any retainers and cases or other orthodontic appliances, and a pair of glasses if they wear contacts. Your child can continue the current medications they have been prescribed. Our medical personnel will work with you and your child’s doctor to continue the same regimen if desired. Typically there will be no change in medication during your child’s stay. Any student experiencing difficulty with his or her medication will be assessed by the program medical personnel, the treatment team, and will work in conjunction with you and your doctor to determine the best solution. We work with adolescents age 12-17 (male and female). You will find that our students are great kids who are making some unwise choices right now. They desire a sense of control and independence in their lives. They are searching for attention and acceptance. Unfortunately they are looking for these things in the wrong places. Our program is a preventative program and is intended to be implemented before an adolescent becomes too severe and set in their behaviors and/or enters the judicial system. No. We are nondenominational and are not affiliated with any religious sect or organization. However, we do recognize the importance of having a spiritual component in daily life including reliance upon a higher power, especially in those seeking change. Students are given the ability to attend a church service if it is offered in the area.